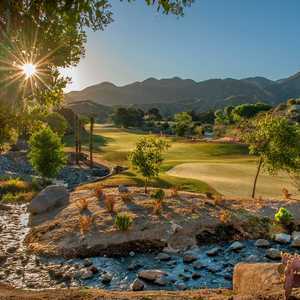 Robinson Ranch golf course in Santa Clarita offers Los Angeles-area golfers quality play with greens fees and annual memberships that are "an amazing bargain" compared to nearby Valencia Country Club or the TPC at Valencia. The 293-yard, par-4 eighth on Robinson Ranch's Mountain Course runs straight uphill from the tees. More photos: Mountain, Valley golf courses at Robinson Ranch G.C. Golf courses in nearby Newhall, Calif. 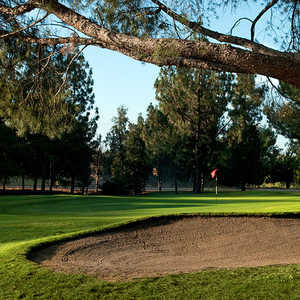 Golf courses in nearby Thousand Oaks, Calif.
SANTA CLARITA, Calif. -- Just north of Los Angeles, the city's smog and traffic din fade and the countryside opens into a patchwork of snaking ravines and expansive valleys, still dominated in many areas by horse ranches and cattle farms. Santa Clarita and its little sister, Valencia, are poised between rural and chic. This is the sort of place a longtime L.A. resident described as "Perfect for people who want to visit LA but are scared of L.A."
The area's shops, hotels and restaurants are upscale and trendy, but affordable. As is the golf. At least some of it, notably Robinson Ranch Golf Club. Opened in 2000, this semiprivate 36-hole facility has the bells and whistles of private clubs - and one more: The long, low whistle that escapes you when you see the membership cost. Robinson Ranch Golf Club encompasses two courses, the Mountain Course (6,508 yards) and the Valley Course (6,903 yards). Both Ted Robinson Jr. designs share features, such as a mix of tight and wide-open tee shots, elevated tees and dramatically undulating greens. But their names suggest a profound difference. Four-year member James Hull, a watercolor artist specializing in golf course paintings, describes the courses as "totally different." "The Valley Course is longer and has a higher slope rating ," Hull says, "but the Mountain Course [137 slope rating] is tougher because it is more target golf. It's especially tough on your short game." Hull's wife, Ellie, adds, "There's always at least one course open, so you can golf any time. And, compared to Valencia Country Club or the TPC at Valencia, where memberships cost over $100,000, this is an amazing bargain." Robinson Ranch's Mountain Course snakes up the hillside overlooking the Valley Course and clubhouse and then back down. Choosing the proper tees is critical, especially selecting between the 6,508-yard tips and the 6,172-yard blues. The course is well-guarded from the bomb-and-gouge strategy by its length. Landing areas feed the sage scrub lining every hole, with countless bumps that can send even well-struck drives scooting to their death. "I score the same from the blue and the black tees because the course opens up from the back," Hull commented. From the blue tees, I carded 11 penalty strokes, many of which resulted from driving the ball through the landing areas into unplayable territory. Playing from the tips would have saved at least six strokes. Golfers who dislike target golf should not eschew the Mountain Course in favor of the more wide-open Valley Course. There are so many scenic holes that it's worth a try. From the first hole, a 532-yard par-5, players get a taste of the day's recurring theme: precision off the tee. The fairway is a half-pipe of short grass threaded between brushy mounds, with a road on the right. The nice feature of the ever-present scrub is that, aside from holes along the road, there's no out of bounds - all the scrub can be played as a lateral hazard. The No. 1 handicap hole is the 398-yard fifth, another tough drive, with a barranca on the left and more sage on the right. The fairway is pinched by oaks and bunkers and mounds just about where you'd like to land your tee shot, and a dry creek cuts across it about 250 yards from the tee. Club choice is half the battle. The 293-yard eighth is a gem of a short par-4. It's drivable but plays uphill and is pockmarked with bunkers one can imagine hopscotching from all the way up to the green. As you make your way up the fairway, turn to the right and you'll see a white-pillared mansion in the distance: the home of PGA pro Duffy Waldorf (and his wine collection). The 388-yard 15th is a stunning par-4. Trees block the left end of the landing area, and a sage-speckled hillside guards the right. A fairway wood from the tee is smart, but the elevated tees beg for a driver. The green is nestled into a stand of oaks. This is supposedly the course's easiest hole, but it can make you feel pretty silly. The 484-yard par-5 closer is a great eagle opportunity but is one of those finishing holes players either love or hate. Hate it if you think a course should end hard; love it if you think ending on a good score is best. The approach can be tricky, though, as the green angles away from the fairway and is guarded by a pond. Robinson Ranch's Valley Course was closed for maintenance the day of our visit, but we inspected one of the oddest holes in the LA area: the 429-yard par-4 ninth. An ancient oak sits in the middle of the fairway - the middle of the landing area. Tee shots either must carry the oak's crown (approximately 290 yards) or skip beneath the branches. Laying back will not help much, as then it must be cleared on the second shot (with a long iron or hybrid club, if you want to reach the green). Everything about Robinson Ranch Golf Club evokes images of how Southern California golf used to be. From the stately clubhouse and outstanding service to the scenic, challenging and affordable courses, daily-fee golfers will have the impression they're playing a private club. And members will feel like they're getting away with a steal. Head Professional Larry Atlas operates one of the top U.S. golf shops and oversees three other teaching professionals on the range and practice facilities. The clubhouse restaurant is open for lunch and dinner and offers inspirational views of the courses. Whether you prefer a more wide-open game or a more precision-style game, the courses provide plenty of vistas and outstanding shot value. Conditioning from tee to green is impeccable. Robinson Ranch is a qualifying site for the AT&T Champions Classic, played at the Valencia Country Club. According to Atlas, several pros come over to hone skills and play fun golf. If Robinson Ranch is enough for the grizzled vets of the Champions Tour, it's plenty good for ... well, it's just plenty good.